This episode of “The Transmission” takes a look at the eleventh episode of Season 5, “Whatever Happened, Happened.” We recap the story in eight minutes, then spend some time discussing it in greater depth. Then, we turn it over to You All Everybody, our brilliant listeners and readers. Then, in the Forward Cabin, we cover (really!) the last week of filming for Season 5. Check out Geoff (a.k.a. 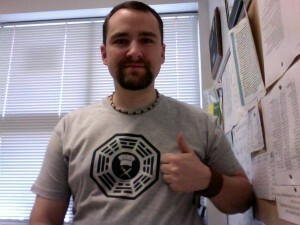 xforce11) and his official “LOST” T-shirt! Get yours! Got a comment about something mentioned in this podcast, or about the podcast itself? Have at it below. Otherwise, we encourage you to continue the main listener discussion about “Whatever Happened, Happened” on the previous post. This entry was posted on Sunday, April 5th, 2009 at 11:17 pm	and is filed under Podcast. You can follow any responses to this entry through the RSS 2.0 feed. You can leave a response, or trackback from your own site. haha I never do that but oh well. The rss feeds are downloading last weeks episode as this weeks. Maybe it’s just me but I couldn’t get the new one on iTunes even though it said it was the new one. I’ve always thought Harper was Annie. I downloaded the podcast from Itunes this morning – it says “Whatever Happened” but the podcast is “He’s our you”… a mixup? Or am I reliving the past? Ha ha. I’ll check again later when I have time – but I really like listening on my commute to work! Thanks. Yeah had the same problem as Stefani, but only with the enhanced version. The Whatever Happened Happened non-enhanced podcast is ok.
i got the same problem too. But, it works on this website. I had the same thing happen, too. Has it been updated? I downloaded it from iTunes this morning and it’s A-OK! As far as the Mr. Friendly observation, I, too, thought that might have been the case while watching the episode, and yet I didn’t want it to be. At the same time, there were so few Others who we actually got to know other than Ben and Mr. Friendly, so I’d say the odds of that being him are pretty high. Also, as I wrote in my blog, I absolutely despised the explanation that Ben “will never be the same” and “forget everything” by going with the Hostiles. Too easy. The writers sure as hell better find a way to better explain this, which certainly could happen in Wednesday’s episode. Well done, R & J.
I had the same problem… The enhanced version came through as “He’s Our You” on iTunes. The un-enhanced version came through fine. At least I have it now. Crisis averted. I can now do the breakfast dishes. Had the same problem as others. It’s 10:13 AM EST and the AAC from iTunes says it’s Whatever Happened by it’s really He’s Our You. I got the “He’s our You” version of this week’s ‘cast as well. Straight through iTunes feed for the enhanced subscription. Is there a solution? I’m gonna listen to it from the site, but I always listen several times, and I want ot make sure my iPod gets the updated file. Sorry, folks. I hate reruns, too! I can’t seem to post a single podcast lately without bungling something. I’ve fixed the Enhanced feed. Please ‘update’ and all should be well. I’m new to your podcasts..only caught the last 4 or so, so if I am talking about something that has been mentioned before, I apologize. This weekend I went back to listen to old podcasts for the beginning of the season and I was listening to the discussion on “This Place is Death” and about some beliefs about God and the Trinity, etc. So far I have not heard any discussion about the possible biblical link between the episode titled “316”. I realize that was the number of the flight everyone took back to the island, but I saw it as a biblical reference to JOHN 3:16 which says “For God so loved the world, that he gave his only begotten Son, that whosoever believeth in him should not perish, but have everlasting life.” I think this could speak volumes about John Locke’s purpose, that everyone needs to believe in him to guide them back to the correct time line and live happily ever after I believe at the end of the series time will correct itself and all will be right with the world and all our Losties, and that we will see them ALL alive and well again. As for the smoke monster, I have always thought of it as a means of passing judgement on someone. Not to mention, parts of that 3:16 phrase were used in that brainwashing room – we’ve seen those before. Hey guys…..This is TJ from Fort Worth Texas…. First I want to say I love the show….You have one of the best podcasts on the net…. In the beginning Sayid said that Danielle’s message was playing for 16 yrs when they first heard the message being played….We “know” that Hurley was the one who was repeating the numbers when Danielle’s crew washed up on shore with Jin…. If Sayid was right and the message was playing for 16 yrs and the interations heard between Danielle’s message were recorded over what hurley said then that would put Hurley recording the numbers in the message around 1988…. Does this mean that the Losties were on the island until then? if so, then what happened to get them off the island a second time? Were they a part of the purge? Are they now a part of the Others? Are they really not on the island anymore? and is that why Sun and Lapedis dont see anyone on the island when they meet Chrisian? Anyway I was just curious as to what you both think on them being on the island until 1988…..
Ryan and Jen, you touched on the possibility that Richard might be playing the priest’s role… I think it’s even more than that; his role might be very similar to the biblical old testament prophet, who was often an advisor to the king but who answered to an obviously higher power. However, Jacob might play this role in addition to, or instead of, Richard. Also, on a somewhat different subject: we keep looking for Annie’s meaning and perhaps a reappearance in a future episode. Could it be that Annie’s main purpose was to personify Ben’s now-lost innocence? It gives a little more meaning to the scene from way-back-when when Ben was wistfully gazing upon the doll Annie gave him. i think ,ben will lose his short term memory,but his long term memory is in tact. Hey, guys. I just want to say a little something to everyone who is annoyed at the whole “Ben will never remember this” loophole the writers have trotted out to seemingly save their behinds and explain away a lot of questions we need answers to. I was with you on this one. It seems like the cheap and easy way out. But then I read Erika Olson’s blog at DarkUFO http://www.darkufo.blogspot.com/ (worth your time…very funny and insightful…cursor over the photos for a laugh) and she brought up a very good point. When Michael Emerson was hired to play the role of Benry, he was only supposed to be in two or three episodes. But we all know the story. He was so brilliant in the role that they decided to keep him on. But what to do now? The scripts that were originally written for the Ben character made no provision for him in the future four seasons. How to reconcile the actions of Ben from Season 2 with those of the following seasons? When Ben met Sayid in season 2, the writers were not worried about the time travel questions regarding Young Ben meeting Sayid in Season 5 because Ben wasn’t going to last beyond Season 2. When faced with that bit of information, I have to give the writers some leeway. I think they had a bit of a conundrum and they have done a good job of trying to reconcile it the best they can. I am curious as to other’s suggestions of how they would handle this situation. Hurley’s recording could have been playing for many years before Rousseau replaced it. Just because it was last playing in 88 doesn’t place Hurley there at that time. Here’s my question… why is Kate the only one ‘worried’ about finding Claire? No one seemed overly concerned when she walked off in the middle of the night. I’m glad that Kate now has a mission other than shipping, but why is she the only one? And why wasn’t Mrs. Littleton not more upset about Kate’s reveal, both of Aaron’s existance and Claire still being on the island? She didn’t even know Claire was pregnant before her accident, right? Thanks for the FABULOUS podcasts! Regarding the theory that Locke, Ben, Cesar and Ilana time-traveled to a point in between the 70s and the present: actually, this is one of those rare instances where we have a definite answer. In one of the recent episodes where the action shifted from Locke & company to Sawyer’s group, there was a title card that read “Thirty Years Earlier.” Since Sawyer established the date to Jack, Kate, and Hurley as 1977, we therefore know that Locke’s group is in 2007. Just listening to the podcast (love it!) and I was wondering – what if Harper was recruited to the island similar to Juliet only, obviously, earlier than Juliet. Then she’s not actually present in 1977 but may know of the woman in the DI pictures hanging on the barracks wall. The Others must have kept the pictures around because Sun & Lapidus saw them. Also isn’t that area of the island trashed in 2007 because of the mercenaries that killed Alex? On the topic raised by Toby above, I believe something doesn’t correlate between the Ajira plane crash time and Frank and Sun’s meeting with Christian. I think the Ajira crash was almost certainly in 2007 (or thereabouts). Like Toby mentioned, we have the ‘thirty years earlier’ caption but we also have the runway, which we believe is the same one being built by Sawyer et al in 2004, and we have the boat Frank and Sun used, which Ben seemed to know would be there when it was there. I also think the Frank, Sun and Christian conversation took place shortly after the purge (early 1980s) because the Others were clearly not occupying the room they met in and it seemed like Dharma had only recently abandoned it. I can’t believe that the Others would not have used that room if available (come on, space wasn’t that plentiful) and my wife even thinks that it was the rec room the Others used when we first got to see them in Othersville. So how do I reconcile these clearly contradictory notions? My theory, and I haven’t seen anyone else suggest it, is that Frank and Sun travelled through time when they used Ben’s boat. I’m thinking that, just like the whole bearing thing when travelling to the island, they arrived on the main island back in the 1980s. Or perhaps the island simply (magically?) shifted them through time deliberately to that point in time, much the same way that Jack, Hurley, Kate and Sayid were deliberately sent to 1977. Perhaps the island didn’t need Sun in 1977, it needed her in the 1980s and it found a way to get her there after the Ajira plane crash. Her story to find Jin may actually play out after the purge and the show may continue on in three timeframes: leading to the purge, post purge and in 2007. Here’s something I thought someone would point out… You know when Jack left Kate and Aaron because he was freaking out, boo hiss? It occured to me after this episode that he actually had a reason to. Not only Kate’s secretive Sawyer-related running around behind his back, but it must have dawned on him at some point that Kate kept Aaron because she had lost Sawyer, and was selfishly filling that emotional void. Jack must have known on some level that he was only there because it was convenient to her, when she was really pining for Sawyer. This adds more weight to Jack telling her, “you didn’t like the old me”. To be living with a woman and feel on some level that you’re only filling space for someone else, I would think that would drive any guy to drink. When I played it on my iPhone, it was treated as a “video podcast” for some reason. This has no impact on how the podcast is displayed or played, BUT it is not possible to turn off the screen like you can with normal audio-only podcasts. (turning off the display stops the audio) Similarly it’s not possible to switch to some other application (web surf, email reading…) wihout stopping the audio. This hour of needless LCD use also makes for substantially more battery consumption. I don’t think this is any problem on my end, hopefully it was just a one-time problem with how this particular episode was encoded. Thanks for your note RobW. Very odd. I have an iPhone and of course subscribe to my own podcast, and haven’t seen that behavior. “Enhanced” podcasts are M4P AACs, which I guess can contain video. But we output straight from GarageBand, which I’m pretty sure couldn’t do video if it wanted to. Did you get the podcast as a “Podcast” subscription in iTunes, or manually download the file and import it? you talk about being irritated with jack because he wouldn’t save ben after juliet and kate both asked him, and really wanted him too. my question is, why would he care what either of them want? they have both dumped him for sawyer. for crying out loud, it’s not like they are his friends. it seems like there are now two camps – those who want to save ben, and those who want to let him die. just like there were two camps earlier those who wanted to leave the island and those who wanted to stay. heres what i don’t get – when kate was going to leave aaron with his grandmother, did she not think it might be a good idea to introduce him to her first? she seems to leave him with people he doesn’t know. she left him with sun, but at least he got to meet her first. just a five minute meeting before she put him to bed in another room would have probably been sufficient, but at least he wouldn’t be picked up by someone who he has never even seen! that’s crazy. re: the “video” version of your podcast. I’ll tinker with it a bit more tonight and let you know. Last response on this issue, I promise! Google tells me that this is apparently an iphone 2.2 bug. Download a chaptered AAC podcast via Wifi, and you’ll get this problem.